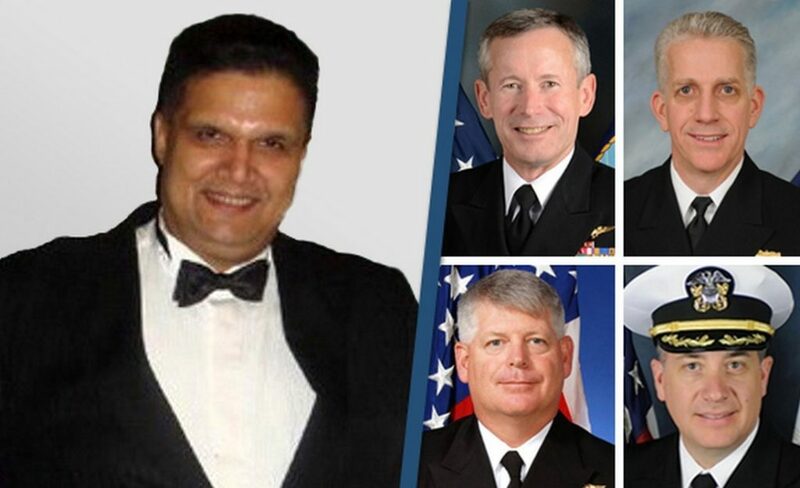 Since 2010, the Navy has been unraveling the now-infamous “Fat Leonard” scandal. Investigators found that a Malaysian ship-support contractor distributed lavish gifts, paid travel expenses and provided prostitutes to Navy personnel in the U.S. 7th Fleet so they would steer business to his company. The wrongdoing in this saga dates back to at least 2004 and has put hundreds of people, including numerous senior officials, under suspicion. How did this go on for so long without detection? And is there anything that may be done now to decrease the likelihood that something similar could happen again in the future? The culture of careerism that the military’s “up-or-out” promotion policy creates undoubtedly played a part in the scandal. As anyone who has served in the military knows, you speak out at your peril — rarely has anyone’s career been enhanced by questioning the actions of their superiors. When your next promotion depends almost entirely on your immediate boss, and you need that promotion to remain in the service long enough to earn a pension, there is little to gain by speaking against a superior. This certainly appeared to be the case in the 7th Fleet. With so many senior officers implicated in this case, it’s no wonder there were few people willing to put their careers and livelihoods on the line to challenge those who had the power to take it all away. Until the military is willing to make serious changes to the personnel system to foster a culture of moral courage, more must be done to protect those who are willing to speak up under the current system to expose wrongdoing. Ultimately the Fat Leonard saga is a case study in the need for greater whistleblower protections and ethics reform. The man at the center of the case is Leonard Glenn Francis, a Malaysian national and the CEO of Glenn Defense Marine Asia. Popularly known as “Fat Leonard” due to his physical stature, his company provided port services, also called husbanding, to the 7th Fleet while it operated in the Pacific. Some of the services include refueling ships, arranging tugboats, removing trash and sewage and acting as a middle-man with the host country to arrange payments for port fees. This is a lucrative business. The 7th Fleet consists of more than 60 ships operating continuously in that part of the world. Each time one of these ships comes into port, the Navy pays a contractor for all of these services. Just one such port call by an aircraft carrier to Port Klang, Malaysia, handled by Glenn Defense Marine Asia in 2006, cost the American people more than $1.2 million. Some fees, particularly port fees and payments for loading and other services at the wharf, vary from country to country. Ports such as Singapore, for example, don’t charge as much in fees as ports such as Laem Chabang in Thailand do. 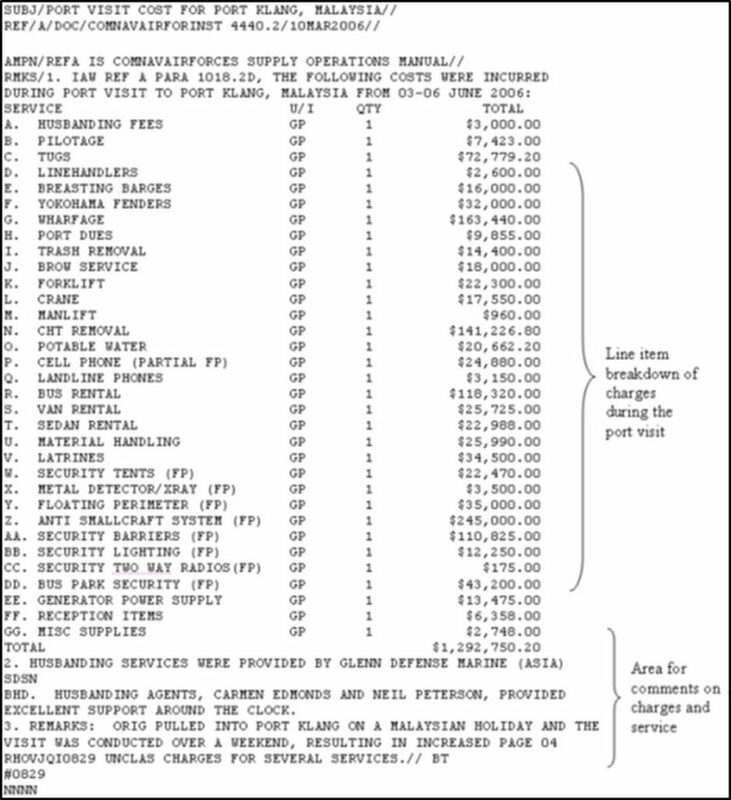 Francis wanted to make sure as many ships, especially aircraft carriers, ended up visiting what he called “pearl ports.” According to court documents, Francis padded his invoices with money for himself on these fees when they were supposed to be at cost. To make sure the big ships made as many stops as possible in the high-revenue ports, he worked to steer them there. As we now know, he did this by bribing Navy officials to schedule visits to the ports he preferred. In January 2015, Francis pleaded guilty to bribery and fraud charges in federal court in California after he was lured to San Diego, the home port of the Pacific Fleet, to attend a change-of-command ceremony and to speak with officials about ways his company could save the Navy money. After he delivered a PowerPoint brief to two admirals, federal law enforcement agents arrested him at his hotel. It is believed his schemes cost taxpayers at least $35 million. As part of his plea agreement, he named several officials, including a Navy captain, he had conspired with to defraud the people of the United States. Several of those named, including Capt. Daniel Dusek, former commanding officer of USS Bonhomme Richard, have already been sentenced in the case. Rear Adm. Robert Gilbeau pleaded guilty in June 2016 to charges that he lied to federal investigators, making him the highest-ranking official charged so far. Three other admirals, including a three-star, received censures for their parts in the case. But the investigation is far from over. So far, 14 people have been charged and approximately 200 remain under investigation. This number includes 30 admirals. That statement demonstrates why we need to do more to provide greater protections for those who want to help stamp out corruption. Over the past 27 years, the Military Whistleblower Protection Act has been periodically updated to provide greater protections for whistleblowers. However, the changes have not kept pace with similar increases in protections in civilian whistleblower statutes, and as a result, service members face a harder battle to prevail in whistleblower reprisal cases. A recent report from the Government Accountability Office report found significant due-process deficiencies for military whistleblowers, with the average reprisal investigation taking 526 days, nearly three times the Department of Defense’s internal 180-day requirement. Even then, of the hundreds of official military whistleblower reprisal complaints submitted each year, the professionals tasked with protecting our military whistleblowers dismiss the vast majority of these complaints. This year, both the Senate and the House National Defense Authorization Acts included whistleblower protections that would go a long way to making the protections offered to service members more consistent with those offered to civilians. Among other whistleblower reforms, the Senate NDAA would strengthen the definition of what actions are considered whistleblower retaliation, clarify that service members have the right to seek judicial review of board decisions in federal court and establish consistent procedures for conducting military whistleblower investigations. A 2009 Department of Justice review found that whistleblower cases investigated by military service I.G.s were of a lower quality than those conducted by the Defense Department I.G. The study also found that this quality deficiency was due, in part, to a lack of consistent standards. Consistent training will go a long way to showing service members and Pentagon employees that they will have a fair shot within the system as a whistleblower. Additionally, the House NDAA would update the burden-of-proof standard for whistleblower retaliation cases for service members to what civilian whistleblowers receive. Currently, in military reprisal cases, service members must prove retaliation was illegal. In civilian cases, the agency must prove retaliation was not illegal. This subtle change means a world of difference, especially when you consider the resources of an individual whistleblower versus those of the Pentagon. Had these protections been in place while the Fat Leonard saga was unfolding, it is not unreasonable to believe that one of the hundreds of witnesses to the debauchery and corruption would have come forward, confident that his or her whistleblowing wouldn’t result in career suicide. Current law doesn’t protect military whistleblowers from retaliatory investigations and allows supervisors to knowingly stand by without taking action when a subordinate is being retaliated against. Updating this portion of law will prohibit this type of retaliation and give whistleblowers a form of redress against it. While not overly burdensome on the Pentagon to implement, these bipartisan reforms will make a great difference to incentivize internal military whistleblowing and protect those brave service members who come forward to strengthen our military system. These reforms are critical and long overdue, and should be implemented before another Fat Leonard scandal makes a mockery of our armed service and our military oversight. This story originally appeared on the website of the Project on Government Oversight.